'Jao Pakhi' it is one of the best novels of Shirshendu Mukhopadhyay. The novel was first published in 1976. The story begins with a village some away from Kolkata. There 22-23 year old young man came to his father Brajogopal. Brajgopal left his sons in Kolkata and stay in a farmer house whose named Baharu in village. Brajogopal relationship with the wife and the child is not good. The reason for not having a good relationship is not too serious. Some personality conflicts, some of the 'cancellation' thoughts of Brajgopal. He does not want to stay in Kolkata, do not like to service. He want, his sons come to the village and doing cultivate. Sons and girls know the father as indifferent to the family, irresponsible. They have no compassion for him. Village and Kolkata - This story created by the tension and adjoining of these two circles. The name of a great novel 'Jao Pakhi by Shirshendu Mukhopadhyay'. Author Shirshendu Mukhopadhyay is one of the greatest novelist at the modern time in Bengali literature. He wrote lot of stories for children and adult person. His first story was published in 1959 in Desh Patrika titled 'Jaltaranga'. Seven years later, his first novel 'Ghun Poka' was published in the same magazine Pujabarshiki. His written books for adults- 'Goynar Baxo', 'Guhamanab', 'Kachher Manush', 'Jugolbandhi', 'Kapurush', 'Criyabhumi', 'Chakra', 'Borosaheb', 'Shyaola', 'Charidik', ''Rangin Sanko'', 'Hatbar', Khudkure', 'Sukher Arale', 'Sampatti', 'Madhur Jonyo', 'Pipul' etc. And for children- 'Raghav Babur Bari', 'Patalghar', 'Boni', 'Bhuture Ghari', 'Gojanoner Kouto', 'Hirer Angti', 'Sadhu Babar Lathi', 'Golmele Lok', etc. Now I want to share another best creation of his 'Jao Pakhi' as pdf. 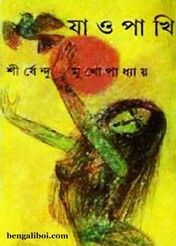 Collect the Bangla Galper Boi as pdf download- 'Jao Pakhi by Shirshendu Mukhopadhyay'.